Recently at a half price book store I stumbled upon a mysterious box set titled: The Yakuza Papers. Other than the title, there were no other words, only a faint image of a man with tattoo on his back. My consumer senses began to tingle and before I knew it, I was the owner of this box set. When I returned home to open it, I found five DVDs, and two packets. One packet was a fold-out “family tree” full of dozens of persons, spanning the decades between 1946 and the early seventies. 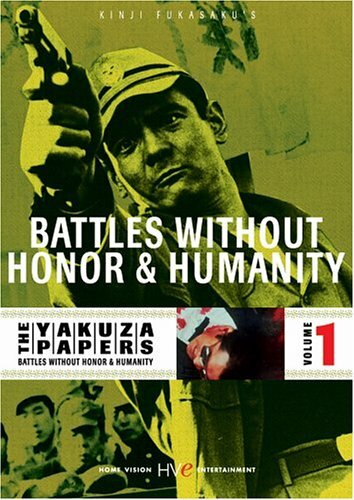 Immediately after I began to watch Battles Without Honor and Humanity, the first film in the Yakuza Papers series, I became completely captivated by this world of the Hiroshima underground. Within a few minutes, a violent and cruel tone is set, and every character is introduced. Due to the large amount of characters, there were many jarring moments in the beginning, where I had no idea who was who, and consequently I couldn’t get emotionally involved. I found myself constantly referring to the “family tree” packet. After the first thirty minutes however, I had found my bearings in the world of the Yakuza Papers, and I could fully enjoy this spectacle. 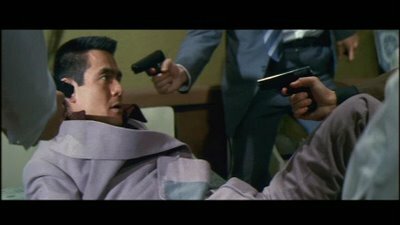 As one could gather from a title like “Battles Without Honor or Humanity,” the film is full of violence and brutal conflict. This being said, this is hardly what I would call ‘mindless violence.’ Once somebody develops a bond with a character, the struggles and suffering the characters go through begin to mean something. Unlike in Transformers or the Star Wars prequels where a fight is just something that looks cool, and I could care less about who gets hurt, I felt the feeling that any good movie should create: a feeling of stake in a character’ conflicts. The cinematography is strong, and seems to me was a heavy influence on directors such as Quentin Tarantino (particularly in the movie Kill Bill, the theme of which was named “Battle Without Honor and Humanity). I thought that the film’s pace was good, and that every single shot was exciting. In conclusion I will say that “Battles Without Honor and Humanity” is a memorable and exciting film, and completely enjoyable. The single flaw is the series of jarring moments at the begin pertaining to the incredibly wide cast of characters. But this flaw is only temporary, and I found that I enjoyed this film more the second time I saw it. I recommend this film to any person fond of Quentin Tarantino, mafia-type movies, and anybody interested in Japan’s yakuza.